Crochet Cami: December!! It's here! Wow, I can't believe that it is December already. And I woke up this morning to lots of snow. What a great way to start the month off. It feels like the Christmas season more when there is lots of snow to go around. As far as my progress on crafts is coming, well, not much is new. I am almost done with my ripple bag that I started forever ago, I've done a few more wash cloths for Christmas presents, and I have organized my craft room. Now it is easier for me to find the stuff I want when I want. And I am proud to say that I was able to condense two tubs of yarn and projects down to one tub, and by tub I mean like the 12 gallon Sterilite containers. My husband was proud. Granted the one tub is a little bulging but it is still one tub! And while I was cleaning, I wound some yarn into center pull balls so that I can keep them all organized and ready for the next project. You know the left overs from previous projects, what are you supposed to do with those. I think I will make an afghan. It will probably be super ugly but it will be warm. Since I have had some questions regarding that I was actually doing with the turkey baster, I tried to make a video to demonstrate how to make the center pull ball of yarn since I was not very good at explaining it. Well, apparently, I am not very good at figuring out how to post a video. So, more pictures and more explanations. I hope this clarifies things better. 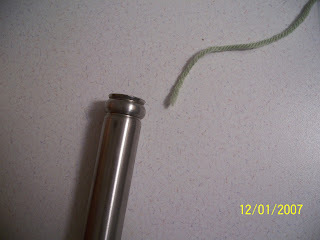 First take the end of the yarn and place it down the center of the turkey baster. So that little piece of yarn in the picture, actually goes into the baster. The continue to wrap the yarn around the baster (outside of it) making sure that the piece in the center stays put and out of the way. 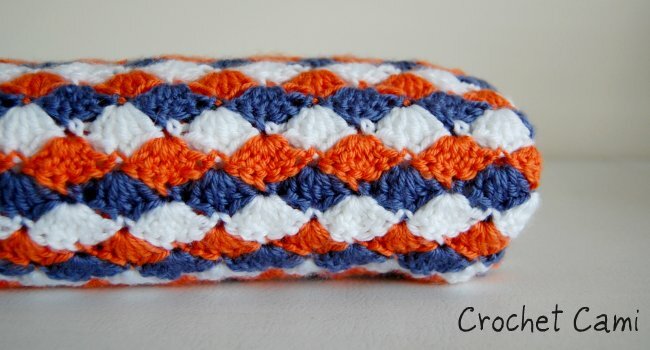 Keep wrapping it around in a circular motion so that it stays round and even - to make a ball. 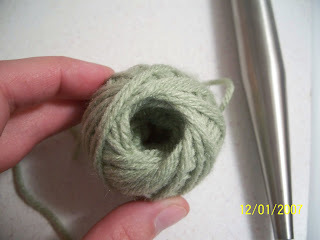 When you are at the end of your yarn, tuck in the lose end so that it stays. Then slide the ball off the end of the baster. You should then be able to pull the yarn from the end that was originally down the center of the baster and it will be a center pull ball of yarn. No tangles! If I ever figure out how to post a video, I might make one if people are still confused. 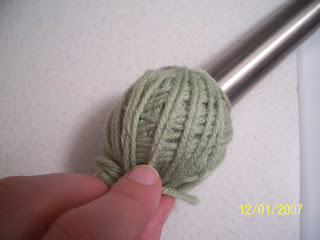 It really is the best way to take any left over yarn and turn it into a ball that is easy to work with. I also hope to have more finished projects to post in the near future. Guess I better get to work. Thanks for the pictures of showing us what you mean. We had a great time in the snow yesterday but now 2 out of 3 kids are sick. So maybe it wasn't worth it. Talk to ya later. That is really awesome! I'm going to try this! Do you think you could use any kind of tube?